DEPLOY became the 8th confirmed starter, Tabcorp was announced as the major race sponsor, and the magnificent trophy for the AU$10-M The Everest was unveiled as the countdown to the world’s richest turf race gathered momentum Friday. The field for the Everest, run at Royal Randwick on 14 October, is taking shape with Deploy joining Chautauqua, Redzel, English, Fell Swoop, She Will Reign, Houtzen and Brave Smash in the starting line-up. It is expected Vega Magic and Redkirk Warrior will soon be announced as Everest runners. They will be racing for a staggering AU$5.8-M 1st prize-money cheque in the Everest and a winner’s trophy worth AU$320,000, the most valuable in world racing. The Everest trophy contains 230 stones of round brilliant cut diamonds, 7777 of black round diamonds and 2 round rubies. A total of 924 man hours were poured into making, setting and polishing the trophy. Champion jockeys Kerrin McEvoy and Hugh Bowman inspected The Everest trophy Friday and cannot wait for the opportunity to win the race’s Inaugural running next month. Jockeys Kerrin McEvoy and Hugh Bowman will be keen get their hands on AU$320,000 diamond-encrusted The Everest trophy next month. Tabcorp Chief Marketing Officer Claire Murphy said Tabcorp could not be more delighted in putting its TAB name to the biggest race of the Sydney Spring Carnival. TAB customers have the chance to win an ownership opportunity with English. If she wins the race, 10 lucky customers will be AU$100,000 richer. Chris Waller Racing confirmed Friday that Deploy, who has smashed track records over the Randwick 1200m and Rosehill 1300m at his last 2 starts, will take its slot in the rich sprint. Deploy will take the slot of Chris Waller Racing in The Everest. Money started flowing in for Deploy Thursday, including 1 bet of AU$4000 at $21. Clearly Innocent and In Her Time have also emerged as possible contenders for The Everest, while crack colt Menari needs to win the Golden Rose to be a chance of starting in the rich sprint. With only two positions to be filled before The Everest field of 12 is finalised, Racing Confidential understands Everest slot-holders have made approaches to connections of Clearly Innocent, while In Her Time is being considered for a start after her stunning barrier trial win earlier this week. Ryan’s brilliant colt Menari is also very much in The Everest frame, although owner-breeder George Altomonte is concentrating on trying to win Saturday’s Golden Rose 1st. Clearly Innocent’s reputation as a big-track horse, his proven ability at Group 1 level, and an impressive track gallop at Newcastle earlier this week has him on the Everest fringe with his effort in the Premiere Stakes on 30 September to decide if he gets into big race. In Her Time, who was runner-up in the Stradbroke Handicap earlier this year beating Clearly Innocent (third), was not in Everest discussions until she zoomed away with a Rosehill barrier trial earlier this week in fast time. Darren Weir’s Everest contender Brave Smash is the $1.75 favorite to win the Testa Rossa Stakes at Caulfield Saturday. Meantime, Hall of Fame trainer David Hayes knows brilliant duo Redkirk Warrior and Vega Magic will be in The Everest field — but he still doesn’t know which slot-holders have locked in the two sprinters. Redkirk Warrior, winner of the Newmarket Handicap back in the autumn, was outstanding in his return to racing at Flemington last week, winning the Bobbie Lewis Quality with ease. His stablemate Vega Magic has been outstanding winning all three starts since joining the Hayes stable including the Group 1 Memsie Stakes from Black Heart Bart and Tosen Stardom last start. The Star Entertainment Group has their slot aligned with the Hayes stable and will have either Redkirk Warrior or Vega Magic running for them at Royal Randwick on 14 October. Redkirk Warrior is all but assured of a slot in The Everest. It is understood leading owners Max Whitby and Neil Werrett are interested in either Hayes sprinter for their Everest slot, as are other slot holders. In latest TAB Fixed Odds betting, Vega Magic is on the second line of betting at $6 alongside Redzel while Redkirk Warrior is pressing at $8. Chautauqua remains the $5 favourite for the world’s richest turf race. TAB is celebrating The Everest by giving TAB customers the chance to share in $1-M if TAB’s runner in the race, English, wins. To be in with a chance to win, play The Everest Climber on the TAB app and climb the 8,848 metres to the Summit. Simply login to the TAB app each day to earn meters towards the Top of Everest. 10 TAB customers that reach the summit will be randomly selected to win the prize of attending The Everest in style, plus AU$100,000 each if TAB’s runner in the race, English, wins. Competition opens next Friday (29 September) and endson Sunday 8 October. Best of all it is free to enter. SYDNEY’S champion mare Winx may have to win in Europe to confirm her world champion status. The international ratings still have Winx trailing America’s Arrogate even though she extended her famous winning streak to 20 with her George Main Stakes triumph last week. Arrogate has been beaten at his last two starts which has strengthened the argument of Winx supporters that the great mare deserves to be rated the world’s best racehorse. Trainer Chris Waller has indicated Winx may be given the opportunity to settle the debate once and for all with an extended overseas campaign next year. At Warwick Farm races during the week, Waller confirmed Winx’s next start will be the Turnbull Stakes at Flemington on 7 October as her final lead-up race into the Cox Plate at Moonee Valley on October 28 then took the opportunity to reveal plans to take the mare overseas after next year’s Sydney autumn carnival. Winx is likely to race in Europe after next year’s Sydney Autumn Carnival. “To ease speculation on her future beyond 2017, I look forward to the autumn and a possible trip overseas but at this stage no decision on this will be made until after the George Ryder Stakes in 2018,’’ Waller said. “During her 20-race winning streak, she has raced on two occasions in Brisbane, three occasions in Melbourne and 15 times in Sydney but obviously international racing possesses a great deal of appeal. HARTNELL is unlikely to take on his old sparring partner Winx in the Turnbull Stakes next month. Trainer James Cummings said Hartnell is likely to have his next start in the Group 1 Underwood Stakes on October 1 as the stayer continues his preparation towards the Caulfield Cup. Cummings had booked Kerrin McEvoy to ride Hartnell in the Underwood earlier this week, prior to Waller announcing Winx would contest the Turnbull Stakes. Hartnell won the Turnbull Stakes in a canter last year but he has been soundly beaten by Winx in seven previous clashes. HONG KONG’s champion jockey Joao Moreira has been booked to ride top stayer Antonio Giuseppe in the Group 1 The Metropolitan at Royal Randwick next Saturday. Antonio Giuseppe is challenging for favouritism in The Metropolitan as he strives to improve on his second in the same race last year. It is expected Moreira will also pick up rides in the other Randwick Group 1 races, the Epsom Handicap and Flight Stakes next weekend. With Moreira’s appearance at the feature Epsom-Metropolitan meeting, the Hong Kong Jockey Club has included the Randwick program on its simulcast schedule. JAMES Harron is banking on Team Snowden’s proven ability to have their horses peak for a big race when his prized colts Pariah and Dracarys line up in the Group 1 Golden Rose Saturday. When the leading owner-syndicator set up his business, James Harron Bloodstock, 2 years ago, he selected Peter and Paul Snowden as exclusive trainers because of their success at developing top quality colts into commercial stallion prospects. Harron’s decision struck immediate rewards with the Snowden-trained Capitalist winning the Golden Slipper last year. “They have this extraordinary ability to get it right on ‘grand final’ day with their horses,’’ Harron said this week. “When Peter was training for Darley, now Godolphin, he had Paul with him and they kept converting with their colts and got the job done on the big days. “The Snowdens have consistently had success with the likes of Denman, Sepoy, Helmet, Epaulette and Shooting To Win over the years and we were lucky enough to have Capitalist win the Golden Slipper. The Harron-owned colts, Pariah and Dracarys, are superbly bred 3-year-olds that were high-profile yearling purchases at the Y 2016 Inglis Easter Sales. Pariah is by super-stallion Redoute’s Choice and cost AUU$700,000 while Dracarys is a son of reigning champion sire Snitzel (who is by Redoute’s Choice) and was knocked down to Harron for a cool $1 million. Both colts are stallions in the making and a Group 1 win will only enhance their future stud prospects. Bloodstock agent James Harron has his eyes on the Golden Rose with Pariah and Dracarys. Pariah is coming off a last-start defeat behind Golden Rose favourite Menari in the Run To The Rose. But Team Snowden was able to turn things around with Sepoy (2011) and Captialist (2016), with both colts coming off second placings prior to winning the Golden Slipper, which gives Harron reason for optimism about Pariah’s chances on Saturday. Harron got the inspiration for Dracarys’s name from the hit TV series Game Of Thrones and maintains the colt is capable of causing an upset in the Golden Rose. 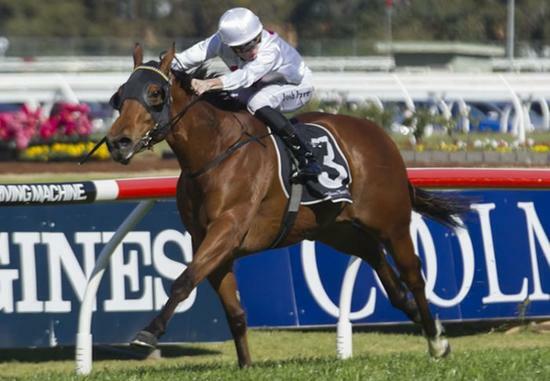 The Harron-Snowden combination is also represented by Coulthard in the Group 3 $200,000 Gloaming Stakes (1800m). Coulthard has been getting beaten in easier races but he is steadily improving with every run and gets out to a more suitable distance on Saturday. “This is a big step up for him but he is fit and healthy,’’ Harron said.